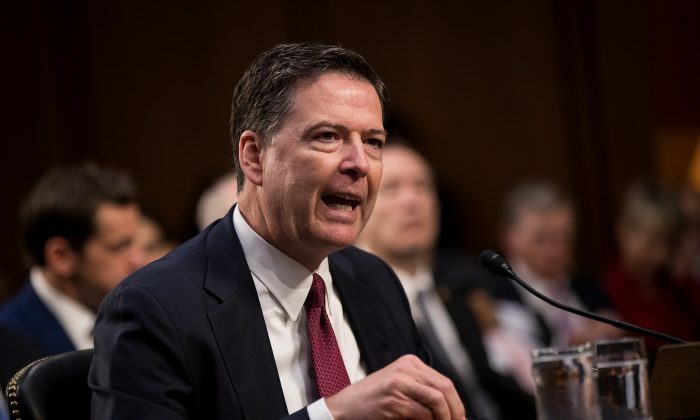 James Comey, the fired former director of the FBI, said he has no idea what Attorney General William Barr was talking about when Barr alleged that spying occurred on Trump’s campaign in 2016. He made the comment during the Hewlett Foundation’s Verify Conference on Thursday, April 11. “So I still think he’s entitled to that presumption. Language like this makes it harder, but I still think he’s entitled to that presumption. And because I don’t know what the heck he’s talking about, that’s all I can say,” he added. “I have never thought of that as ‘spying,'” he said. Barr said that spying on Trump Campaign in 2016 “did occur” during an April 10 hearing before the Senate Appropriations Committee. “I think spying did occur, yes. I think spying did occur,” he confirmed when Sen. Jeanne Shaheen (D-N.H.) asked if he suggested that spying occurred. He also said that he wants to pull everything together from the various investigations at the Capitol and in the DOJ and see if there are any remaining questions to be addressed. Trump said he agreed with Barr’s testimony about spying on his campaign. Trump made the initial claim more than two years ago that his campaign was spied on by the Obama administration. At the time, little evidence was available to back up the president’s claim, but investigations by Republicans in Congress have established that the FBI surveilled at least one Trump campaign associate. Barr is the first DOJ official to acknowledge that the Trump campaign was the target of a spying operation. Considering his position as the nation’s top prosecutor, the testimony marks a major turning point for both the public’s perception of the matter and the legal consequences for those involved, The Epoch Times reported. During the 2016 elections, officials in the #Obama admin, including cabinet-level officials, extensively spied on the campaign of then-candidate Trump. According to the media outlet, evidence suggests that Obama officials used at least five methods to spy on the campaign.